In previous posts about Tonner's "Travelling with Mother to Savannah", I posted pictures of the ensemble. 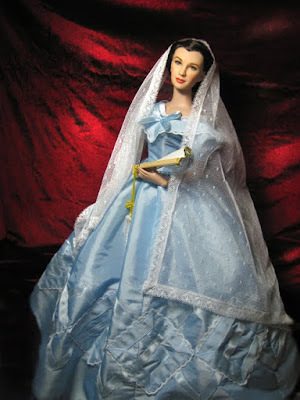 Here now is the doll wearing Tonner Melanie's dress to Scarlett's Wedding. 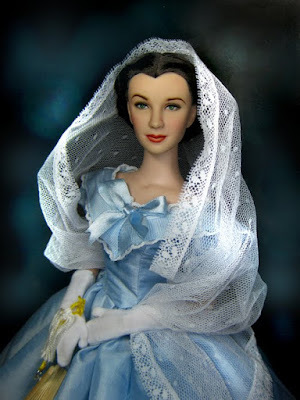 I think the "immaculate" pale blue is an excellent complement to the doll's supposedly fair complexion. What I find unique about the "Travelling with Mother to Savannah" doll is its hairstyle -- it has a very defined middle part that goes all the way to the back. Something you don't find in the regular Tonner Basic Scarlett. The hairstyle is very much Civil War inspired with two braids crowning the head and intertwined at the back. The hair is very tight and I had to loosen it a bit to bring it down as much as possible. The effect is a hairstyle that can wear the Franklin Mint Wedding Gown (which unfortunately because of its rarity) I do not have. 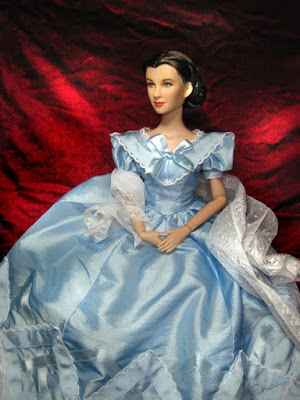 I am thinking Tonner will re-create this sometime soon as it still has a strong "want' in the marketplace. And I foresee, it may be priced at a premium price than the rest of the line (hope not, we've had too much of overpriced dolls which sell for less than half at year's end). The inspiration for the portraits are Cecil Beaton's photographs. A famous photographer for royalties and fashion. 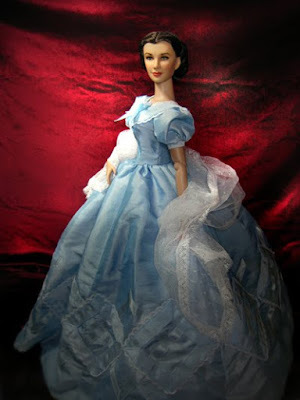 Now why wear Melly's blue gown? First, I think the fabric is very much similar to ones worn for Victorian portraits. The gown captures the light and drapes in a billowy, balloon-like manner. Every fold seems to behave in the same manner fabrics do in Beaton portraits. The fan is from Ashton Drake's "Love After the Hours". Unseen here are the bonnet that comes with the Melanie blue ensemble and the white gloves. 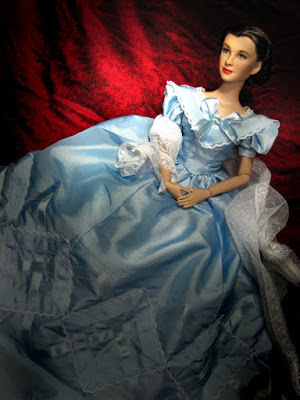 I wish Tonner would use more of fabric that drapes and captures the light well. It really is a sight to behold in person versus the organza they choose to use. The outfit is completed with charming period shoes with buckle in pal blue, stockings and hooped skirt with layering of tulle. Wow ! Exquisite ! Though Scarlett seems particularly quiet and almost shy in Melly's gown, you captured her expression perfectly ! The composition and poses are wonderful too. Yes you are right, that's a nice hairstyle for Scarlett, but what did you do at the rear of the head ? 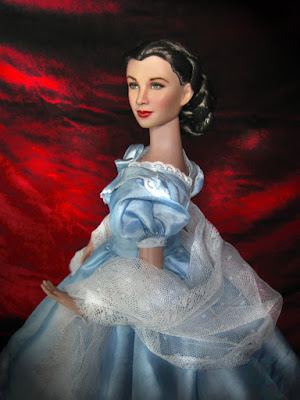 On the "Scarlett travels..." doll, the chignon is a lot more down on the back than the one you have here. Great job as always mr B. !! Beautiful portraits! The fan is a great touch! Excellent photography as always. Thanks again Dave! Cecil Beaton was the inspiration. Although not Beaton-like in results. I just wish I had more doll clothes to mix and match. Perhaps I can have Alana do some tops and skirts that can be mixed and matched later on. Meantime 2010 Tonner Scarletts are being manufactured. I'll probably scratch my head if I see the prices again. Hoping they would be gentler on the collectors this time. It's kind of a game with both Tonner & Franklin Mint. Rarely do you want to buy them as soon as they are released, because generally the price eventually comes down. However, you don't want to wait too long because sometimes they sell out and then fetch even higher prices on ebay. All part of the "fun" I guess! You hit the nail on the head Dave! It's how I often discern musts, needs and wants in purchases. My only wish is that they sell the outfits separately -- and that FM finally does articulation. 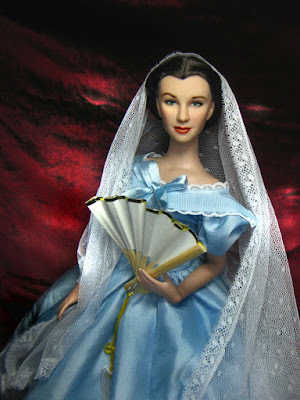 Looking Back: Repainted Tonner "Don't Look Back"